‘Pretty in pink, our flocked tree glitters with hundreds of fairy lights. Dreamy floral blooms in shades of rose, lavender and peach set the scene for romance. Decorations with metallic accents in silver and champagne tones add sparkle and glamour to this enchanting Christmas tree’. The modern interior trend for pastel colours has moved into Christmas decorating. For the customer there’s a great choice of pastel decorations which look fabulous on a flocked tree or a white tree. In fact there’s so much choice that this year three of our display trees reflect this colour theme. 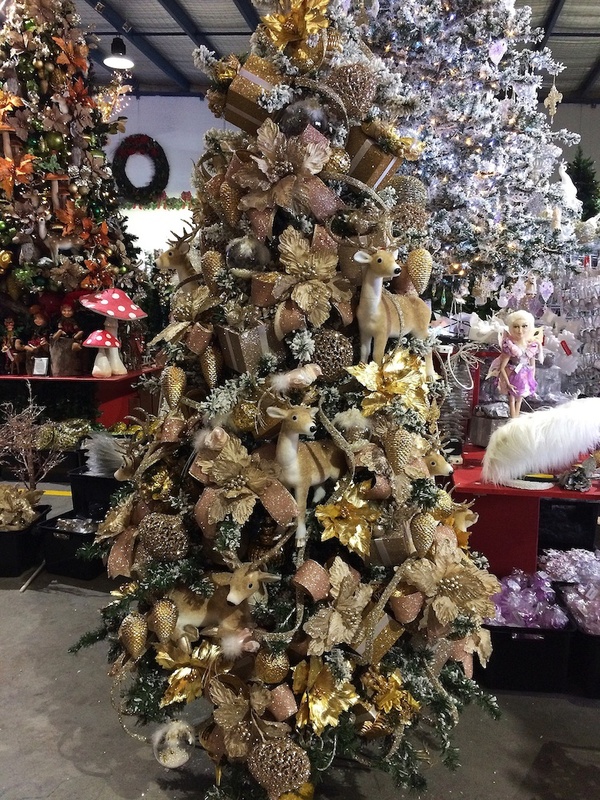 If you like the look of our “champagne” tree here’s how to do it. I started with a 7.5 ft white flocked tree and added white lights, make sure you buy lights with a white or transparent cord. To make the bows I overlapped two layers of ribbon, a metallic blush with a cream velvet and added a flower to the front of the bow. Position the finished bows throughout the tree, these are a great space filler. Add the larger decorations first, I had these reindeer which were the perfect colour match. Fill the gaps with smaller decorations but be careful to distribute evenly. A few glass decorations will add that extra sparkle. Finally the beaded ribbon, it’s so easy to use (secure with the tips of the tree) and really completes the look by unifying the whole tree and adding an extra dimension. At a later date I added larger decorative items such as this ballerina and completed the look with an ornate crown which I used as a tree topper.